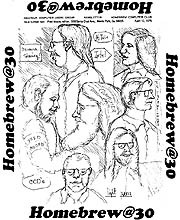 Report from the Homebrew@30 Event! What in Hades was the Homebrew Computer Club? 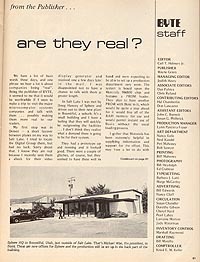 On March 5, 1975 a very special meeting took place at Gordon French's garage in the then freshly named "Silicon Valley". 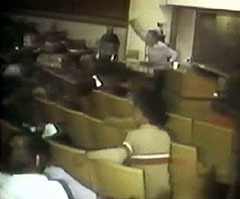 This was the first gathering of the "Homebrew" Computer Club (also called the Amateur Computer User's Group). Now this was no amateur group of folks but the very acorn of the great tree of the personal computing revolution to come. Want to know where Steve Jobs and Steve Wozniak introduced the Apple I?... through the Club! The hand-soldered microcomputer grew up to become the personal computer through the guiding hands of Homebrew Club members and the many other clubs and enterprises that popped up like mushrooms in the late 1970s. What a time and what a Club it was, so we came together on November 5th, 2005, to cut a cake, toggle in a boot loader or two and hear from some of the members of that core kernel team that compiled us the nerd world in which we are all seemingly permanently uploaded. Michael Holley - whiz kid! scored the room (then and now)! Allen Baum - helped make Apple I and much more! Read about our Panelists for this event which was held at 1:00pm Saturday November 5th, 2005. Sellam Ismail of the Vintage Computer Festival and Computer History Museum introduced the event and Bruce Damer, curator of the DigiBarn, hosted and emceed it. Lee Felsenstein screened an excerpt from a DVD of a film just released about early Club member and newsletter editor Fred Moore and did a tremendous job of telling stories and keeping the other Club members hopping along. Homebrew@30 was a special event produced by the DigiBarn Computer Museum (a kind of giant Homebrewer's garage in the Santa Cruz Mountains right next to Silicon Valley) and hosted by the Vintage Computer Festival 8.0 and held on November 5, 2005 in Mountain View, California at the Computer History Museum. At the VCF there were plenty of great exhibits of Homebrew-era gear all weekend (das blinkenlights of the Altair 8800) and a special tour of the DigiBarn was held on late Sunday afternoon. Preview the incredible Cake Image for this year's celebration! To understand more about why we did the Homebrew@30 event or if you want to find out more about the Club please dont forget to see our super duper online exhibit of several years of Homebrew Club newsletters and other memorabilia. Catch our video and audio of the panel too. See our previous two "@30" events, the Maze War Retrospective and Alto 30th birthday party also held at the VCF in 2004 and 2003. 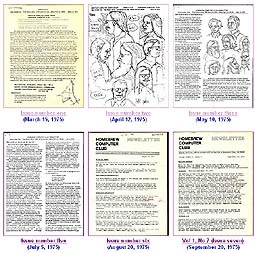 Know any more about the Homebrew Computer Club or have any pictures, movies, stories or artifacts to contribute to this effort? Contact us! 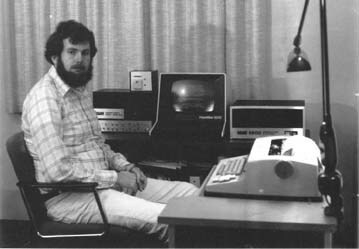 From Michael Holley, a Homebrew Computer page and a picture of Michael Holley with his SWTPC system shortly after he moved to Seattle. The DigiBarn's own Online Exhibits of Homebrew-related stuff! The DigiBarn has been gathering artifacts, running systems and stories about the Club and its times for several years. We invite you to explore (and add to) this growing online exhibit which is featured at the links below. The First West Coast Computer Faire, YOU can be a part of it!